Chris Salthouse is in charge of M/V CHASE ONE. This is a 58-knot tender that can support the AC72 for 14-hour days without a return-to-base. And, perish the thought, right the AC72 should they capsize. 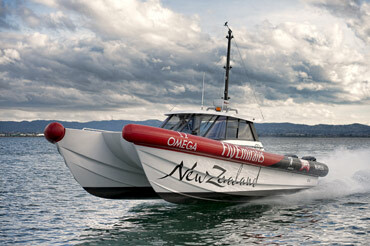 Salthouse has carved out another niche with the team, putting him in charge of a pretty cool new toy – he worked with Pete Melvin of Melvin & Morelli Design & Engineering, one of ETNZ’s AC72 designers, to come up with a state-of-the-art catamaran chase boat that meets the daunting task of keeping up with the team’s America’s Cup boat. “We started with a blank piece of paper, and a budget,” explains Salthouse. “The old Protector boats were great for working with Version 5 boats; they could go all day at 12 or 13 knots. With these big boats, it’s one thing to be able to go fast, but you’ve got to be able to go fast for long periods of time. With the 30-day rule between now and February, the days on the water are going to be long, 12 or 14 hours. If you’re doing 30 knots all the time, you have to have something that’s efficient and fast, with a range capable of being out there all day to support the boat. “You’ve also got to have a boat big enough to carry all the spares to keep the boat on the water. We can’t keep coming back to the dock, so we have to carry sailmakers, hydraulic guys, winch guys, engineers, designers – all these guys and all the spare parts, like boatbuilding parts, sailmaking parts, wing repair parts, rigging, all that stuff. That’s what drove us to design a catamaran, the need for something fuel efficient and light, something that would go quicker than what we had and could carry more gear. Michelle Slade interviews Kevin Hall – the head of the Artemis performance-instrumentation team. This excerpt illuminates some of the complexities and tradeoffs associated with the ongoing hydrofoil experiments. There is no free lunch. (…) You guys don’t seem to be putting much emphasis on foiling – what’s your thinking on that? KH: I remember being in one of the very early design team meetings and one of the assignments for the performance team was to make sure we were on top of all the things we would want to measure, maybe occasionally have some sailor input. Adam (May) and I are both Moth sailors. At that meeting, [designer] Juan [Kuoyoumdjian] and his team came in and announced that it was clear that if you could get a boat foiling and going straight and fast, there was a little bit less drag so it went faster. We had that discussion a long time ago, but it’s correct. We’re not pursuing it to the same extent that the other teams have because there’s always been the question of control. It’s one thing to get something to fly in a model and it’s another to get it to fly in the real world. Hats off to ETNZ for doing that – really! Then there are trade-offs after that. You pay a price for generating the lift to be able to fly—that price is the drag—then you pay another price for generating that lift in a way that also gives not active control like we have in the Moth but a form like that you can control as the height/lift/leeway changes. They’ve done a good job of making that fairly self-regulating. For us, we’re not sure that all those penalties are worth it. So while you’ll probably sure you’ll see our boat out of the water a bit, I’m not sure how much. There’s rumor that foils may be abandoned because of the size of the course. KH: Even on a really good day on a Moth, you do have to bear away and get up on the foils before get going fast. For that brief time you’re slower than a boat that’s designed to sail through the water traditionally. They may already have worked out that all those little times where you have to heat up after a jibe or bear away [after a tack], maybe that’s too costly. We can kind of tell a little bit what they’re doing when they’re going straight but it’s very hard to have a feel for all the dynamic stuff from faraway. Certainly they [ETNZ] know that. I’ve just got off a Skype call with the “enemy” – Richard Slater, rules advisor for Oracle Team USA who, like their skipper, is Australian. (…) The topic was the on-the-water racing rules, known officially as the “ISAF Racing Rules of Sailing America’s Cup Edition”. Past America’s Cup regattas have been governed by the ISAF Racing Rules with limited changes needed for AC yachts. Fast catamarans with completely different handling characteristics racing on short courses needed a new approach. A simplified set of rules to suit the cats evolved; they have been trialled at the AC 45 events with progressive improvements and amendments after each event. A majority of the competitors must approve an amendment, achieved by discussions and negotiations amongst teams’ rules advisors. The process is cooperative rather than adversarial, with everyone aiming to achieve the same goal – a practical set of rules giving the sailors simplicity and certainty in situations on the race course which often become complex very quickly. Sailors have to know their rights and obligations instantly. The job of a rules advisor is to ensure there are no gaps in that knowledge, the more complicated and uncertain the rules are, the more difficult this is. In some respects, such as at the windward mark, the AC rules are radically different from the standard ISAF rules. The sailors have embraced them and they are working well. Many of the changes could well be incorporated in to future ISAF versions of the racing rules. The big change at the windward mark is that the first boat to reach the three-length zone “owns” the rights to that mark even if the yachts are on opposite tacks. If a yacht is at that point either clear ahead or overlapped on an outside yacht it is entitled to room to round the mark including the room to tack. These rights are lost only if it leaves the zone. Basic rules such as a port yacht keeping clear of starboard, the clear astern yacht keeping clear, and the windward yacht keeping clear of a leeward yacht remain the same. Rule 17, prohibiting a yacht which establishes an overlap from clear astern from sailing above its proper course, has been deleted. In match racing this rule has always created arguments about “what is” a proper course, sailors were often in doubt about who was the obligated yacht, and it required difficult subjective calls by umpires. Many contentious decisions resulted. Different tactics apply but the change provides certainty and works well. Having certainty in the wording of the rules is only part of the story Like all sports there is a need for consistency of interpretation and application of the rules by the umpires. The penalty system and umpiring in this edition of the America’s Cup is also radically different from previous events, but that is a subject for another day……. (…) Let’s talk about Luna Rossa’s performance over the past few days here? SE: The first day for us was survival – it was real rough and real windy and we really didn’t want to capsize like Artemis and be up all night fixing stuff for not really a lot of points for the overall event. If you look into how the event works, you really have to be on your game come Saturday/Sunday. It was the roughest day we’ve been in the 45s and not that we took it easy but the guys did a nice job of just getting the boats around the course with the wing still in the air. SE: We did – today was a really nice day of sailing. When we came to Naples and the time we spent an hour north of here, that was the kind of conditions that we’ve been sailing in – just a nice 10-knots in relatively flat water – kind of what you expected when you come here. It’s spring time so it can be anything and there’s more coming so there’ll be some excitement this weekend. SE: It’s the second day of our first event – the wing is new for everyone, the boat is a little bigger than the Extreme 40s, the experience is pretty balanced between the two boats with crew coming from the 40s, and half the team coming from the version 5 or some other form of monohull sailing so they’re getting up to speed with catamaran sailing. I think it’s going just fine considering just a few months ago a few of those guys hadn’t never been cat sailing. At the end of the day you get the good start, you play the shifts and you go fast and it’s a yacht race. SE: I think the real work is getting the A sails up and down physically. That’s a big job for two people and it happens quickly. Yesterday on a few of the runs the boats didn’t even bother putting the kites up – farther into the race the positions were so defined as they were – the boats are pretty powered up just with the wing so you’re not going to double speed just because you have the A sail up. We just wanted to get through the day with the result that they were getting and be happy with that. SE: It’s my first event and the races almost seem a little long – 35 minute races. It was almost surprising as to how long the beats are but that said, it’s cool that they put the gate right down at the leeward wall – I would bet it’s within 75 yards of the wall – it’d be crazy to be down there at that railing looking down at the boats coming crashing into the gates – it’s pretty neat. SE: It went well – I pinch myself a little bit and use the analogy of the New York Yankees – to be let into an institution like Team NZ when I’ve been on the outside for 20 years – pretty interesting, there’s smart, hard-working people, people who’ve been at it a long time, and a lot of continuity. Grant (Dalton) has kept a real neat institution there. He’s a tough guy but I have a lot of respect for him. The guys who are good at what they do are very good. You find a lot of teams – including Luna Rossa – you spend quite a bit of time of the campaign getting to where you can just work together, speaking the language, using the same computer software, creating the same sailing techniques – that’s why Coutts and his merry men were such a force back in the 80s in match racing – they’ve sailed together for 25 years. People who put teams together and try to overcome a group like that…you’re always going to be coming up against those relationships that you can’t put together over night. SE: It’s crazy! You look at the sea wall – it’s basically a 4-lane road which is what I’m kind of looking out at and if I glance up and down there’s about 300 hundred people just looking at the boats moored, just hanging out (7pm-ish local time). They’re into Prada they’re definitely into Luna Rossa, they’re definitely into sailing and there’s something about the America’s Cup. It’s been a part of Italy for quite sometime. And, the event is pretty cool – I’ll say that about it. It’s hard not to miss it. It’s literally physically taking up a big area of a very prominent nice waterfront – even if you wandered anywhere within a mile from here you’d be affected by parking and people and the chatter. SE: Hulls are getting close to being finished – perhaps another month. Then they’ll be shipped to New Zealand May/June to be assembled. It’s coming together – probably three months out. The idea is that we’ll sail it for the first time there. Our team’s energy has really been focused on getting through this regatta and Venice. Thanks to Kimball Livingston for this update: Luna Rossa Changes the Equation. This is especially exciting for us because Morrelli & Melvin designed ADAGIO, and they are a key part of the ETNZ design brain trust. So, having observed this much, Patrizio Bertelli decides that he wants to play in America’s Cup 34, after all. This could almost be read as a vote of confidence, eh? And the design-sharing agreement announced today along with the announcement of the challenge itself—Luna Rossa joins the game and gains access to Emirates Team New Zealand’s design process, and a training partner—accomplishes important goals for both teams. ETNZ has been needing an infusion of cash, and Luna Rossa is suddenly as caught-up as any challenger out there. 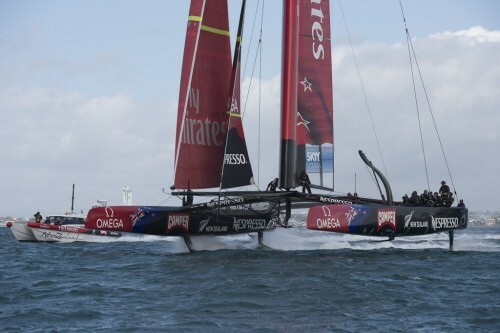 Or are we missing the fact that when ETNZ head Grant Dalton refers to “our design team” he is including the likes of Morrelli & Melvin, an office that not only helped to design Oracle Racing’s giant trimaran for the hostile takeover of 2010, but also wrote the AC72 rule. Nobody brings more spirit to America’s Cup competition than the Italians, so welcome back. Has the investment in the World Series been worthwhile? The events are very useful for promoting the America’s Cup. The teams need a road show – what’s the road to the America’s Cup? Where are the teams? What’s the visibility? How do they get the sponsors? So, having a circuit that’s identified that the teams and sponsors can count on and that the public can watch on the internet, on TV or in person, all that is part of building the fan base and creating a bigger value in 2013. (…) the concept of a road show to help all the teams and the event build value and get fans and sponsors therefore interested again in the America’s Cup is necessary. I think they’ve been top-shelf events, from the hospitality to the event side with lots of activities at night. It’s a lot more than just the racing. The television product is very enhanced over anything we’ve ever seen before. The races are shorter and the 25-30 minute format is great. Exactly what detail and level of expenditure should be consumed is what is being fine tuned right now but to say we’d be better off without it at all is not true. I love Cayard interviews — Paul doesn’t hold much back. He says what he likes and doesn’t like about AC34. Read the whole thing.